This spring we were pleased to announce that aACE had been recognized as a significant ERP Contender in SoftwareAdvice.com’s 2017 FrontRunners Report, a round-up of top-performing business management solutions. Powered by Gartner’s data-driven methodology, this quadrant relies on user reviews and other data to highlight products that offer the best capability and value for their class. 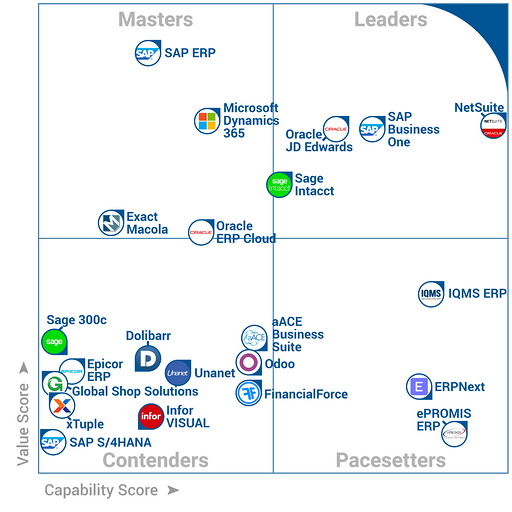 Last month the folks at SoftwareAdvice.com took another look at their ERP quadrant – and this time around, aACE earned even higher scores on both axes. Capability: We've gone up from a 3.45 to a 3.69 in Capability over the past six months. The Capability score is based on factors such as user ratings of the product's functionality, ease of use, and customer support, as well as other data assessed by SoftwareAdvice.com. Value: Our Value score has risen from a 3.00 to a 3.58 over same short time frame. The Value score is based on factors such as user satisfaction, the likelihood that users will recommend the product to others, and how valuable users consider the product to be, among other data points. "I would recommend this software to anyone wanting to simplify his or her workflow, anyone who wants their software to work for them and not the other way around, and anyone tired of the ERP money pit!" – Todd Breedlove, Vice President, Knight Hardwood Flooring, Inc.
To see where aACE placed on the FrontRunners quadrant and download a breakdown of our scores, visit SoftwareAdvice.com. And to learn more about what aACE Enterprise Resource Software for Mac and PC can do for your business, contact us today.